Bluestacks tease the Gamepop as OUYA's console is delayed until June 25th. Some of you guys out there might have heard of the company Bluestacks. They're probably best known for their efforts on giving Windows and Mac computers the ability to run Android apps in their emulator, which works really well. 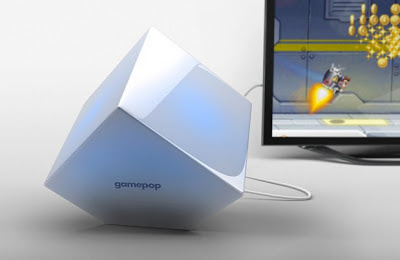 But, it seems that the guys are looking to diversify and the way they're hoping to do that is to tackle the OUYA and the GameStick head on with their new 'Gamepop' device. The Gamepop is a little Android 4.2 Jelly Bean-based console which runs mobile games on your big screen! Throughout May BlueStacks are happy to offer you the device 'for free' when you drop $93.83 on a one-year subscription which basically buys you the console and access to all of the games. At the moment Bluestacks promise that there will be "over 500" games, but there aren't too many specifics at the moment. The guys behind Fruit Ninja have already said that, "We've been a featured partner in App Player since early on and they've delivered on every promise in terms of distribution... GamePop is a great incremental channel for us." Developers will receive their cut of the 50% of the total subscriptions which are paid to Bluestacks. The device which this will be going head-to-head with is the OUYA. We already know everything there is to know about the console, but the ship date for non-Kickstarter orders has been pushed back to June the 25th as the guys have updated the design of the controllers to alleviate some 'issues' and this deadline also allows them to put more devices on store shelves. The Gamepop is an interesting take on this new mobile games on the TV craze and we'll see how this goes when everything is launched. In the mean time you can check out the video below which gives you a little more information or alternatively head over to Gamepop's website here if you're interested in pre-ordering the device.